I don't normally do cakes — they're just not really in my culinary repertoire. I figure it's mostly because baking a cake is a long process. Anything worth doing is worth taking the time to do right but if you're like me, it's hard to carve the necessary time out of a busy day to make extra-involved meals and desserts. One of my goals with KLB is to show simple and quick-to-prepare meals that any home cook can carve time out for. Following a Pure Vegetarian diet even part-time means you'll be cooking at home much more than eating out, so I like to show tasty recipes that don't take hours to pull together — you can come home from work and have dinner ready in under an hour. But every once in a while, it feels good to go all-out and bake a cake. I devoted a few hours this weekend to doing exactly that. This cake is rich and indulgent, and though it's a three-recipe process, preparing it isn't difficult at all. There are a few secret weapons involved: Dutch-processed cocoa powder, espresso powder, and chocolate extract. Using these special ingredients is key in making a restaurant-quality, indulgent chocolate cake. All three can be found at specialty stores and gourmet markets. The links supplied are meant as examples — you might find different brands at your local store. A side note: Be sure to have parchment paper on hand — you'll be needing it when you assemble your cake. To start: Preheat the oven to 350°F. Grease and flour 2 round 9-inch cake pans; set aside. Prepare the batter: In a large bowl, whisk the soy milk and vinegar together, and set aside for a minute or two to curdle. Add the sugar, oil, vanilla extract, and chocolate extract to the soy milk mixture and beat with a hand mixer until foamy. In another large bowl, sift the flour, cocoa powder, espresso powder, baking soda, baking powder and salt together, and mix with a wooden spoon to thoroughly combine. In two batches, add dry ingredients to wet ingredients and beat with a hand mixer until smooth. Transfer cake pans to a cooling rack and let cool until the bottoms of the pans are cool to the touch. Hold a sheet of parchment paper over the top of each pan, one at a time. Gently flip pan over to remove the cake layer, and return to wire rack with parchment between the cake layer and the rack. Allow both cake layers to cool completely before assembling your cake. In the meantime, make the Blackberry Sauce: Add all of the ingredients to a medium saucepan over medium heat, and reduce for 20 - 30 minutes, stirring occasionally. Be sure to keep checking and stirring to keep the mixture from burning. Once the berries have popped (you may also muddle them a little as you stir, to get them started), and the ingredients have reduced and thickened, remove the pan from the heat and set aside for 10 minutes to cool. Pour the sauce through a fine mesh sieve over a small bowl. With the back of a wooden spoon or a spatula, press the berries to strain the juices. Discard the berries and seeds remaining in the sieve. You should have 1/2 to 3/4 cup sauce when you’re finished. And make the Ganache: In another medium saucepan over medium heat, heat the soy creamer and Earth Balance until just about to simmer (you'll start to notice small bubbles beginning to form around the edges). Remove the pan from the heat; add the chocolate chips and allow them to sit for a few seconds, then stir them in until they are completely melted and the creamer/Earth Balance mixture is incorporated. Add the exctracts and agave, and stir to combine. Set aside to cool for 10 - 15 minutes (or longer if you prefer an even thicker ganache). Assemble the cake: Place a square of parchment paper on a cake stand, large enough to cover most of the area, but small enough to not show through when the cake is in place. Gently pick up the bottom cake layer from the cooling rack, and place it on the cake stand, flat-side (the side that was in the bottom of the pan) up. Tear small pieces of parchment; slide them under the cake to create a removable barrier between it and the cake stand. Pour cooled Blackberry Sauce into the center of the cake layer; using a regular spatula or cake spatula, spread to coat entire surface evenly. Gently remove the second cake layer from the cooling rack and place it on top of the Blackberry Sauce layer, flat-side (the side that was in the bottom of the pan) down. Brush any loose crumbs from the cake. Using a knife or cake spatula, spread a thin coat of ganache over top and sides of cake to seal in crumbs and create a smooth surface on which to apply the final layer of ganache. Refrigerate your cake on the stand for 5 - 10 minutes to allow this crumb coat to set. Once set, remove cake from refrigerator, and pour the remaining ganache into the center of the cake. 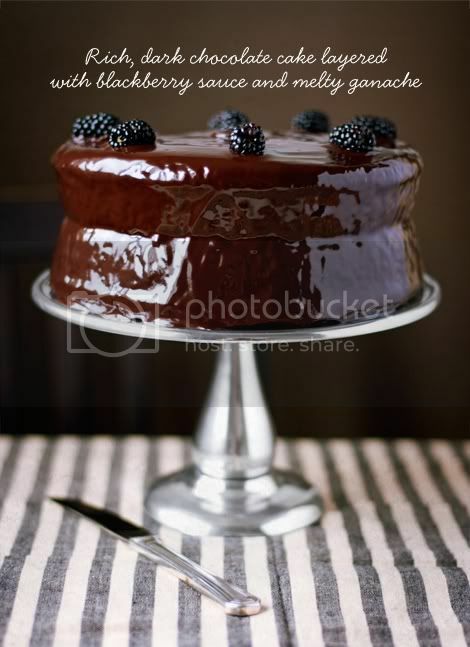 Working quickly, spread the ganache with a large metal spatula or knife, pushing the ganache over the sides of the cake. 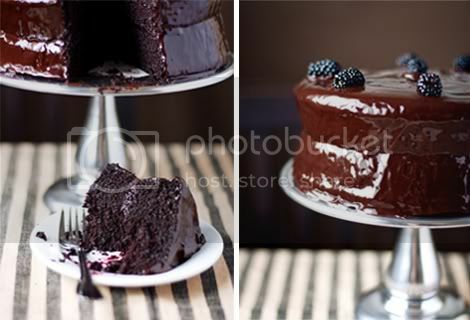 Smooth top and sides with your cake spatula, and if there are any bare spots on the side of the cake, cover with ganache. Garnish top of cake with leftover blackberries. Let the ganache set at room temperature before carefully removing your parchement barrier, and serving or covering and storing the cake. i will try this. thank you for this.